A Simple Wish. Bubble Factory 1997. 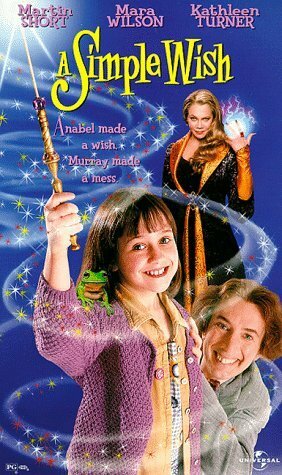 I’m not sure if Matilda is intentionally being invoked by the posters, or if it’s more of a coincidence of starring Mara Wilson and having a 90s “whimsical fantasy” aesthetic. The story isn’t much like Matilda at all really. Anyway, the poster design wouldn’t have gotten me interested (I think I liked Matilda, but if I wanted to see it again I could just see it again. Actually, I ought to see it again), but it’s again in the big, cheap collection of movies I recently got, and the description on IMDB shows potential. But what really got me interested was the tagline. “Anabel made a wish. Murray made a mess.” That’s almost certainly an oversimplification, but it suggests a fun, haphazard style of accidental magic. Anabel’s father Oliver works as a Central Park carriage driver by day, but he’s a struggling actor looking for a break. He’s somehow up for the lead in a Broadway musical despite being a nobody, but if he doesn’t get the part Anabel’s brother Charlie is convinced they’ll have to leave New York and move in with family out west. Anabel wishes for help from a fairy godmother to get her father the part, and she gets Murray, a fairy godfather male fairy godmother who barely passed his exams, on his first real assignment. Before he can cast the magic necessary to get Oliver the part, Murray realizes he’s late for the national Fairy Godmother conference and he rushes off to it, leaving his wand behind. Meanwhile, Claudia, expelled fairy godmother turned witch, has taken advantage of the conference to steal all their wands in an attempt to secure a monopoly on white magic as well as black. With Murray and his wand safely late and out of the way, he’s the only fairy to escape. But his wand got broken while with Anabel. And his first attempt at granting her wish turned Oliver into a statue. This movie does operate on a simpler level than an adult may want to hold it to. They explain why Oliver is auditioning for the lead in the most prestigious new Broadway show ever, but his performance is so good (and recognized as such), it’s a wonder he hasn’t made a name for himself on smaller stages already. He doesn’t need supernatural intervention, he needs a smaller pond. Additionally, the other fairies may be without their wands, and so not in a position to use magic, but they just disappear after their wands are stolen, resting the stakes described as involving the entire world’s white magic users on just two supporting characters and Murray. The entire world is a few New York neighborhoods, apparently. And Middle of Nowhere, Nebraska. Of course, the reason to watch this movie is to see Martin Short bumble. He always brings his best to the material, and his material is the best in the movie to begin with. He and Mara Wilson play very well off each other, and there’s a good father-daughter performance between her and Robert Pastorelli. Kathleen Turner hams her villainous role, but never feels very threatening, which may go back to the scale issues the writing has. I want to give special mention to the songs for Two Cities. The score of the movie doesn’t capture attention (which is arguably a good thing), but within the movie there are songs for the show Oliver is up for, which is supposed to be a parody of Broadway. Making a musical out of A Tale of Two Cities sounds like a hilariously bad idea, but pretty much all we see of it is excerpts of a few songs, and they’re not that bad. In fact, Oliver’s performance (Pastorelli isn’t known for singing, but there’s no other vocalist credited, so I’m not sure who’s really singing for Oliver) elevates them to legitimacy. I’m interested in hearing more from Two Cities, and I don’t think I’m supposed to be. I don’t have a problem with small movies, but I have a problem with movies that seem to think they’re bigger than they are. I had a similar problem with Batman Returns (and to a lesser extent, its predecessor). There are some pretty ambitious effects here, and they’re mostly handled very well, but they never open up the world like it’s implied they could, and it feels like the money they spent on some obvious CG could have been spent on more concrete production values. But in the end, all this adult thinking just gets in the way of having a gleeful romp in New York with Martin Short, which is most of what this movie is trying to achieve. And on that scale, it deftly passes.